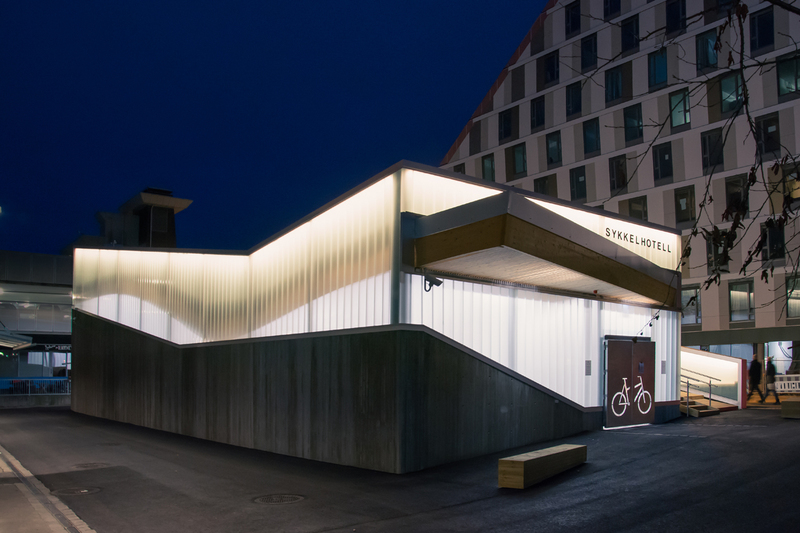 Art of Transit: check out the fancy new ‘bike hotel’ at a train station in Lillestrøm, Norway. 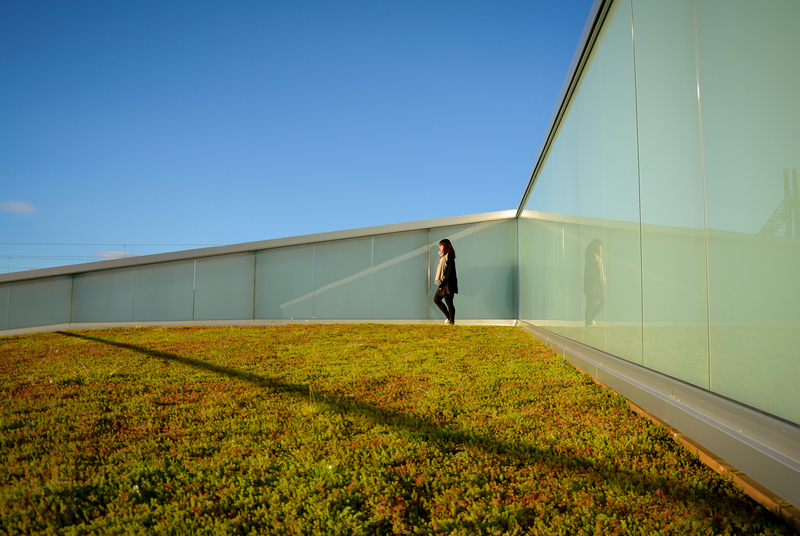 Photos by Various Architects. Click above to visit their site. The FBI says that a foreign government intercepted an imminent threat specifically about the Universal City/Studio City Station on the Red Line, but declined to say which government. The Los Angeles Sheriff’s Department and the Los Angeles Police Department have said that law enforcement is working to determine if the threat was credible or a hoax. The FBI, LASD and LAPD held a news conference last night. In the meantime, security has been ramped up at that station and across the Metro system, according to the agency and the police. Here is the latest news release from Metro. The important point is, as always, be vigilant and if you see something, say something. You can call Metro’s Transit Watch Hotline at 888.950.SAFE (7233) or notify us through the Transit Watch app. I’d be remiss not to mention that this threat comes amid Metro’s consideration of a policing contract for the agency. The agency’s Board of Directors voted last week to delay a vote on that contract until February. The staff proposal calls for splitting the work between the LASD, LAPD and the Long Beach P.D. The LASD is the sole agency with the contract at present — and who gets the contract is a bit of a political tussle. More in last week’s post. Long road to go on this issue but a feasibility study is being done for Metro that will look at the possibility of eliminating some street crossings for the Blue Line — which crosses dozens of streets and runs down the middle of others on its 22-mile journey between downtown L.A. and downtown Long Beach. One of those crossings to be studied specifically is Wardlow in Long Beach. 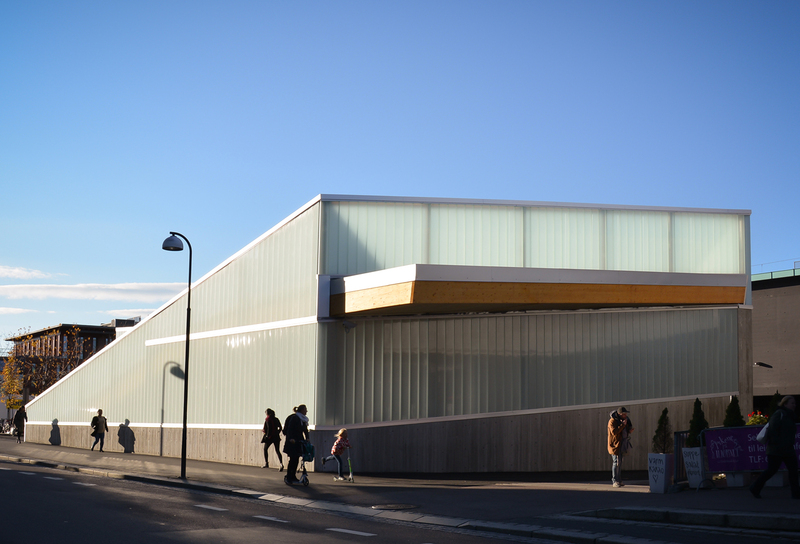 A rendering is above. Of course, funding is always an issue for this sort of thing. But the recently-approved Measure M sales tax measure could be of help. Stay tuned. The rendering, btw, comes from this report, which includes info on several other studies or efforts underway to improve the Blue Line, which is the oldest in the Metro Rail system. It opened in summer 1990. Speaking of Measure M, one of the projects it will help fund is a northern extension of the Crenshaw/LAX Line. The city of West Hollywood — a big-time supporter of Measure M and previous Metro sales tax measures — has lobbied hard to be connected to the Metro Rail system over the years. And now WeHo envisions that taking place with this project, which could route the Crenshaw/LAX Line north from its current northern terminus at Exposition Boulevard to West Hollywood and then to the Red Line in Hollywood. Under the Measure M spending plan, the project isn’t scheduled to open until the late 2040s but Metro officials have said they will try to accelerate this project and others through public-private partnerships — and that the environmental study for this project will soon begin in case it can be accelerated. The study will be key and Metro will likely hire a consultant (as per usual) to help write and research the study (these things are enormous tasks). The study will ultimately decide a route and the route is what everyone is curious about as this line could potentially mean having a light rail line that runs from Torrance via a Green Line extension, then up the route of the Crenshaw/LAX Line to WeHo and then to Hollywood. Such a line would have transfers to the Green Line, Expo Line, Purple Line and Red Line, not to mention transfers to future Measure M projects — such as a rail line connecting LAX to the San Fernando Valley and a bus rapid transit project to run along Lincoln Boulevard between LAX and Santa Monica. Yeah, that’s a lot to process and a lot of this stuff is still a ways down the road. But the passage of M will allow the studies to get underway on Crenshaw North and other projects and these studies should offer a clearer vision of what’s possible with our transit system. Interlude that has little to do with transit: A year ago at this time there was still the possibility we’d be writing Go Metro to see the Raiders blog posts. The Raiders are leading the AFC. The Rams are not leading the NFC. That said, the fact that the Rams only surrendered 26 points to the Patriots on the Pats’ home turf is perhaps something positive. I wouldn’t be shocked if the Rams D gives the Falcons some issues this Sunday at the Coliseum; after all, the Falcons are known for starting strong and choking, much like Carl did Sunday night when offered an opportunity to rid the world of Negan. How to Go Metro to Rams games is here. King County Metro and Sound Transit will be rolling out the smartphone app that lets users buy transit tickets on their phone and forgo using an Orca Card, the area’s equivalent of our TAP card. So will Metro be following suit? At some point quite possibly, says Metro’s TAP staff, who I spoke to yesterday about this issue. First, one important point. There are no turnstiles at rail stations in the Seattle region. Patrons ‘tap’ their Orca cards before and after boarding and the appropriate fare is deducted from the balance on their cards. At the same time, and as Source readers have pointed out in the past, smart phones can be used to, for example, store a boarding pass and then board an airplane. That is good for people like me who put things in pockets that then magically disappear into the ether. First, there’s no single proprietary system that Metro can purchase that would allow a smartphone to get a passenger through a turnstile. Second, sinking millions of taxpayer dollars on one particular system at this time doesn’t seem prudent because the technology may still change. The transit fare systems that do use smartphones are either ungated or have spent many millions of dollars on the technology. Three, there are usually airport/airline staff on hand to help passengers use boarding passes on their smartphones. That’s not the case at Metro stations and turnstiles, which are often unstaffed and sometimes have to handle a lot more people than can fit on a single airplane. In the meantime, the TAP card website does work on smartphones and riders can use it to add stored value to their TAP cards, with rail riders being able to use that stored value usually within about 15 minutes. It’s not the same as using your phone as a TAP card, but it does mean that you can add fares to your card even when you’re nowhere near a TAP vending machine. (It takes longer to use stored value purchased online on buses because that info is uploaded to the bus’ farebox/TAP system when the buses are back in their maintenance divisions). On another front, Metro is working toward broadening the ways that TAP cards can be used. A contract approved by the agency’s Board of Directors last week will update TAP technology so that TAP cards can be used to purchase more than just transit — i.e. parking and bike share and car share and things along those lines. Things to read whilst transiting: Fun graphics on the NYT’s Upshot blog on the people/things that President-elect Donald Trump has tweeted about the most over the past 18 months. By ‘about’ I mean ‘targeted.’ Of course, we all ‘target’ things at times. I recently went on a perhaps-wine-fueled late night Twitter rant against the ‘American Baking Show.’ Not that entertaining! In the news: The L.A. County Board of Supervisors voted unanimously Tuesday to place a quarter-cent sales tax increase on the March 2017 ballot to help fund homeless programs. The idea is to compliment the $1.2-billion bond measure for homeless programs that was approved last month by voters in the city of Los Angeles. The sales tax idea has broad support thus far, but obviously hasn’t yet come before county voters, who last month approved Metro’s Measure M, a half-cent sales tax increase. 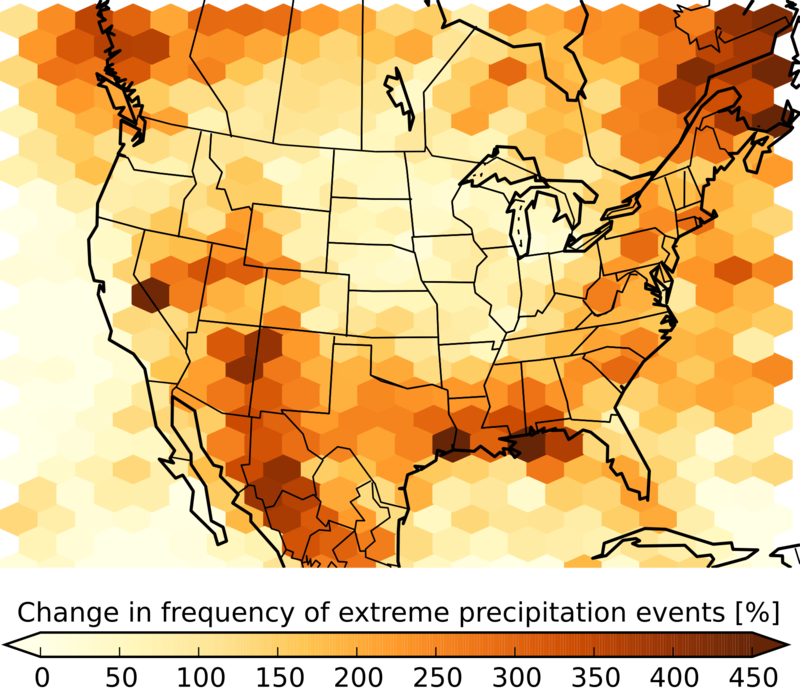 The study is by the National Center for Atmospheric Research and suggests that North America is in for more extreme weather events (as well as hotter weather), although there will be regional differences. California would not be impacted as much as other areas and the study doesn’t suggest we’ll get wetter — just that more rain could come in bunches. Worried about global warming? As we’ve said before, generally speaking taking transit instead of driving alone is one way to reduce your greenhouse gas emissions. Walking and biking more often are even more tailpipe-free. Related: Trump’s meeting with Al Gore gives environmentalists hope, reports the NYT. The meeting was presumably about climate change, which has been an issue that Gore has long championed. But neither President-elect Trump or Gore is saying much and Trump continues to consider a number of appointees — many have which have denied global warming is happening — for key government posts that concern the environment, the NYT adds. Quasi-related: Google says it will run entirely on renewable energy by 2017, also reports the NYT. That will be quite a feat since Google last year used as much energy as the city of San Francisco. In the future, your Google searches and ads for that thing you searched for online will be powered by wind or solar, so says the Google mothership. 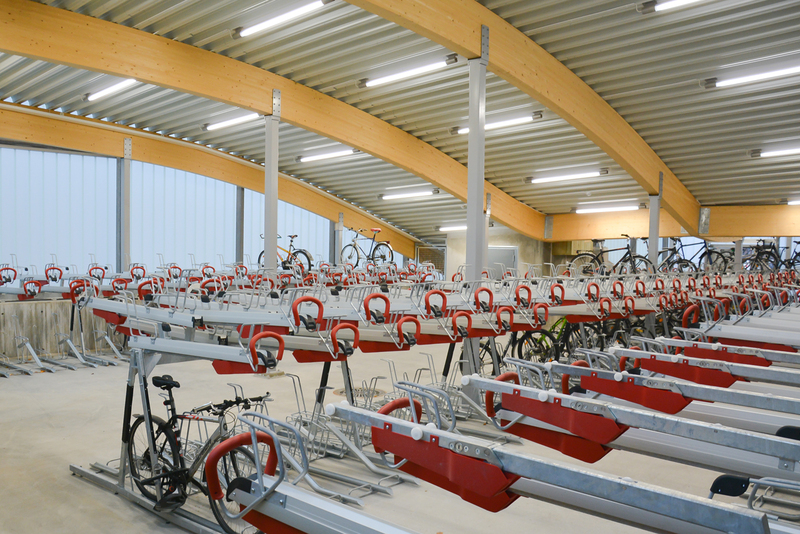 Transit, taxi, car rental or bike: Finns can purchase them all through Whim. See the above video. It’s not particularly cheap — see below — but certainly intriguing. FYI, one Euro currently equals about 1.07 U.S. dollars. When it comes to using app, let’s not forget the lack of cell signal in underground area. I’d rather see Metro to allocate resources to make the TAP website even more user-friendly, such as allowing to rename a card or remove a card no longer in use. Theres cell signal in some of the underground areas or stations..
Not to mention that it is nearing the end of 2016 and I cannot contact either Metro Security or LASD Transit Policing by Text/SMS. The Metro security App is aimed at reporting terrorism not crime, and is only available to Android or iOS users. Hmm. One city I visited this year (Portland, OR, I think) has onboard TVMs. That’s the Portland Streetcar, which is separate from the main public transit system (TriMet), although TriMet operates and maintains the streetcar system under contract. But TriMet’s actual LRT system, MAX, does not have onboard TVMs. TfL’s implementation of NFC payment technology on top of “TAP/Oyster” card system works really well, even allowing riders to tap for single trip rides and once the fares hit a “ceiling” for a day pass, the system no longer deducts any fees and essentially your single rides turn into a day pass. Makes it easy for tourists/casual riders who may not know if they will need a day pass or not. So why can’t Metro, which also uses Cubic fare collection?? IMO Metro should concentrate more on getting the large number of riders who Still Do Not Use TAP and slow up bus boarding. More thinking outside the box needed in Metro HQ. All that would require is offering a lower fare for TAP card users. Done in San Francisco as of January 1, so cannot be illegal in California. But as you say “outside the box”. I’m not sure why grade separation at Wardlow would be a big priority: There doesn’t appear to be an acute safety issue (the recent improvements added passenger safety gates), trains always have priority at the grade crossing, and the impact of the grade crossing on car traffic is fairly small except at the peak of rush hour. Also, the rendering suggests that parking would be substantially impacted, having just been improved by the recent station upgrades. Reduced parking is probably the wrong thing to do for this particular station, which is in a low density neighborhood with great automobile access (right off the 405) and not very good bus connections; for this reason Wardlow is my choice station when driving to Metro but not when taking the bus to Metro. An aerial station with reduced parking at Wardlow only makes sense in conjunction with substantial neighborhood densification and improved bus connections. And a beautiful rending it is. 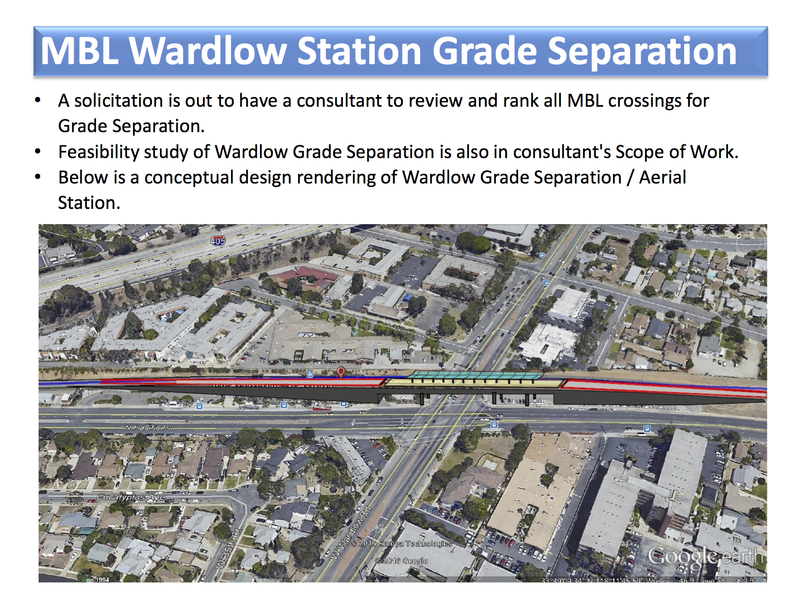 Raising the MBL: Wardlow traffic = minor impact during construction. Blue Line = do a shoefly single track around the construction for a year. Blue line headways up to 10 minutes since single track between Del Amo & Willow. Or would we have to live with a year of shuttle buses between Del Amo & Willow? This is not going to be an easy one. If I understand the rendering, there will be hardly any impact on Blue Line operations: it looks like the aerial structure will be between the north and south parking lots, immediately to the west of the current station and tracks, so it can be built without impacting train operations at all. The only effect on train operations would be when the new structure is connected to the existing tracks, which could probably take place over a weekend. Or perhaps two weekends — one to connect the tracks for pre-revenue testing, then a second weekend a few months later when the existing station is decommissioned and prepared for demolition. So in terms of train operations, this looks like a great plan. However, parking would be severely impacted during construction, and probably in the long term as well (I don’t think the same capacity can be put in the space vacated by the current station). And the cost of this grade separation would be high, for fairly little benefit. So I think this should be a low priority project. As someone else commented here, grade separation south of Willow should be a much higher priority — though admittedly at a much higher cost. They should grade seperate the whole blue line especially the downtown part.. Some so-called liberal should identify the Huge Pot of Money that will pay for total grade separation. IMO Metro should start small and look at grade sep for Florence and Vernon. Some adjacent properties needed for an road underpass shouldn’t be that expensive. One or two steps at a time, please. If the issue with implementing an app rests on the existence of turnstiles, get rid of the turnstiles and use the money that is being to paid to lease them ($300,000 per month) to hire LOCAL people to enforce fares. This obsession with the turnstiles that have been proven to be ineffective is really getting embarrassing. Yes. This is a perfect example of things being on a case by case basis. When old school works just fine, or even better, it really doesn’t make sense to blindly chasing technology just because other agencies do that. While any grade separation is a step in the right direction, especially for the accident-prone blue line, the main priority ought to be the slow street-running sections on either end where there are no gates and trains must wait at traffic signals impacting service. In particular, the section from the at-grade Washington blvd. blue-expo junction to the subway tunnel at 11th street must be trenched or elevated as that is the most accident prone and congested section of the route. This would be a much better use of funds (even despite construction impacts) than separating sections in low-density areas where the train already has absolute preemption at 55 mph (65 would be more appropriate though).